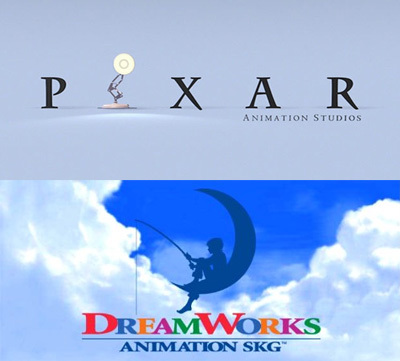 And this one goes easily to our Pixar Pals of Emeryville CA, as their upcoming Up easily clobbers Katzenberg and Ko.’s Monsters vs. Aliens – and that’s just based on seeing the first half of Up vs. all of MvA. A few weeks back Up‘s Pete Docter and Jonas Rivera – the film’s director and producer – were in New York to screen the film’s first 45 minutes and answer a few questions. 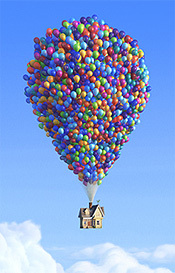 You probably know what’s ‘up’ with Up (chuckle – don’t throw that at me, I’m sorry!) – elderly balloon salesman Carl Fredricksen blows ‘up’ (I won’t do it again, I promise!) his inventory and floats his house off to South America to take the dream vacation he and his late wife were never able to. Right off the bat, ‘thumbs-up’ for Up (missed me, ha-ha – ow!) for making a 78-year old the film’s protagonist – and not indulging in a single ‘he’s funny because his false teeth fell out’ gag. Having him turn off his hearing aid so he won’t have to listen to someone’s annoying prattle – that’s a legitimate gag that laughs with, not at Carl. Picking ‘up’ (I’m hiding, you’ll never find me behind this – uh-oh…) from where Wall-E left off, a lengthy silent montage early in the film details Carl’s marriage, from his wedding day to his wife’s passing. Even with her gone, Carl still thinks of her, talks to her in a thinking-out-loud (not delusional) way and refers to his house as “ours” – the one he won’t sell to developers who are surrounding it with a high-rise complex. When a rash act gives the developer a reason to grab the house, it’s communicated – again silently yet oh-so-eloquently – by the developer bringing his hand to rest on the house’s wooden fence. 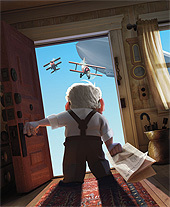 It’s those little touches that make you go ‘ahh’ in a Pixar film. When Carl’s house first lifts ‘up’ (aw c’mon, that one was legit – whew!) and the camera follows it into the sky, we see – just for a moment – a flash of sunlight on a glass skyscraper down the street. The gruff Carl discovers a stowaway on board, an overeager eight year old would-be scout, and it’s no giveaway to tell you the pair reach Carl’s goal – a mysterious South American plateau. It’s here they meet a variety of weirdo-animals and – the first half came to an abrupt end. In the post-screening chat, Docter spoke about taking the film’s emotional foundation seriously rather than indulge in old-age jokes. He mentioned George Booth’s New Yorker cartoons of grouchy old men as one inspiration while observing “this is Pixar’s tenth film – it gets harder and harder to find fresh things to do.” The verdict: Coraline has its first competitor for 2010’s Best Animated Feature Oscar.